If you shopped on Black Friday or Cyber Monday, chances are you did what smart shoppers are supposed to do around the holidays. You saved your receipt, just in case. When it comes to investing, the equivalent to "saving your receipt" is keeping good records of your transactions, statements and other account information. When you invest, your accounts generate a great deal of paperwork. The paper trail ranges from trade confirmations to account statements, to IRS Form 1099 tax records, which report the taxable interest, dividends and distributions paid directly to account holders or shareholders. At times you might find the volume overwhelming, especially as your portfolio expands. And there may be times, perhaps when markets swoon, that you simply don't feel like opening your account statements. But reviewing and managing your account information is essential. It's the only way you'll know that money you sent to your mutual fund or brokerage account was invested, the instructions you gave were followed and no unauthorized transactions or withdrawals were made. Even in today's increasingly paperless world, it's still a good idea to keep hard copies of key investment records (this may mean printing them out yourself if you have chosen to go paperless with a financial institution). If you store your investment records efficiently, you'll have important information on hand when you need it—including when you file tax returns. And if something ever does go wrong with your account or you have problems with your brokerage firm, good recordkeeping can provide proof of the investments you made, when you made them, how much you invested and other relevant details you may need to make your case. 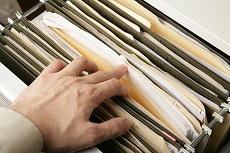 In fact, there are times when it makes sense to generate a little paperwork yourself. For example, if you question a specific transaction, you can begin with a phone call, but you'll want to write a follow-up letter or email. This paper trail can be an important part of making a formal complaint and pursuing a resolution. One of the most important reasons to keep good investment records is to simplify the process of preparing your federal income tax returns and state returns if they apply. Unless your investments are in a tax-deferred account such as an IRA or 401(k), you must pay income taxes if your stocks pay dividends, your mutual funds make distributions—even if the dividends and distributions were reinvested—or you collect interest income from your bonds and cash investments. You must also pay capital gains taxes if you sell your investments for more than you paid for them or if your mutual fund passes profits it makes from selling investments along to you as capital gains distributions. Whatever your tax liability, having the right information handy helps ensure that you pay what you owe—but not more. If you don't keep thorough investment tax records, you might find yourself spending hours as the filing deadline approaches gathering information that you could have compiled as you went along. Simply hiring an accountant is not the solution to bad recordkeeping because you still have to provide the details the accountant needs to prepare your returns. While brokerages have cost-basis reporting obligations, it's still important that you keep good records of your transactions. Hold on to trade confirmations showing how much you paid for specific shares, or keep track of that information on your own records at home. Also be sure to track stock of dividends or non-dividend distributions you receive because they may affect the cost basis of your shares. One approach to cost-basis recordkeeping is to keep a separate worksheet for each investment, showing when you bought it, how much you spent, how many shares or units you bought and what commission you paid. Commissions are considered part of the investment cost. Keep that paperwork in a file with your monthly and end-of-year statements, which keep you up-to-date with what's happening in your account. By maintaining records, you'll have your cost basis, which is what you originally paid for an investment when you bought it, plus the cost of making the investment, such as commissions you paid. Knowing your cost basis is important when you sell an investment since you will either owe capital gains tax on any profit you earn or be able to use capital losses to offset other gains or ordinary income. If you receive an investment as a gift instead of buying it, you might also record the former owner's cost basis if you know this information. And if you eventually gift your investments to other people, they will need to know your original cost basis as well. If you inherit an investment, you'll want a record of its market value on the day your benefactor's estate was valued. The bottom line is that the IRS expects you to keep and maintain records that identify the cost basis of your securities. If you do not have adequate records, you may have to rely on the cost basis that your broker reports—or you may be required to treat the cost basis as zero. For this reason, you may want to check whether you have cost-basis information for any securities you want to sell before you do so. It's smart to divide your investment records into those you'll use for short-term reference and those that go into long-term files or storage for three to seven years or longer. Once a year, it's a good idea to overhaul your records, discarding those that you no longer need. For example, if your mutual fund company sends an end-of-year summary detailing all your transactions, you can usually discard the monthly statements you received throughout the year. End-of-year summary account statements from your brokerage firm, mutual fund company or other financial institution where you have an investment account, plus statements from college savings plans and retirement savings plans. Copies of your annual IRS Form 1099s, which show dividends, interest and capital gains from your investments. Transaction records confirming your purchase or sale of stocks, bonds and other investments. Your brokerage firm is not required to keep such records indefinitely, so it's smart to hold onto this information yourself for at least three years after you've sold an investment. Copies of your federal and state tax returns going back seven years, along with supporting documentation. Copies of your IRA and 401(k) plan documents. At your death, your beneficiaries will need this information to determine how to take distributions from your account. Long-term storage is particularly important for tax records, which, of course, are often affected by your investments ' performance. Although the Internal Revenue Service can normally audit your income tax returns for just three years, it can investigate your tax records for up to seven years. It 's also important to keep any records of purchase for as long as you hold an investment. When you do discard investment records, be absolutely sure that they don't fall into the wrong hands—identity theft is a fast-growing crime. To reduce the chances of a stranger accessing your information, you can destroy investment papers with a shredding machine. Shredding is particularly important for any records bearing your account numbers and personal identification numbers.